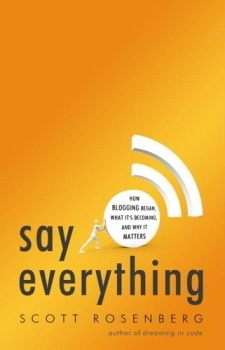 I'm currently reading Scott Rosenberg's Say Everything, his new history of blogging that digs deeply into the origins of the medium and why it has become so successful. Rosenberg, a founder of Salon.Com and an online acquaintance of mine for many years, has written a fascinating book that begins with chapters on early web diarists and bloggers such as Justin Hall, Jorn Barger and Joshua Marshall. At 8:58 a.m., Metafilter, a popular group blog, posted a link to a one-line news bulletin on the front page of the CNN web site, but CNN did not yet have a full story posted. I was reading MetaFilter when TV networks reported that a plane had struck the World Trade Center, so I made one of three front-page posts that appeared on MetaFilter within two minutes of AP's first news alert. In my haste, I posted that a plane had struck the World Trade Center in Chicago. MetaFilter publisher Matt Haughey removed my post quickly and saved me from considerable shame, but you can still see a comment that documents my egregious mistake: "Just as an FYI, it's New York City, not Chicago." So let the history books show that I was there for a pivotal moment in the history of blogging -- spreading false information. "This unfathomable tragedy reminds me of the original reason the Internet was invented in 1969 -- to serve as a decentralized network that couldn't be brought down by a military attack," said Rogers Cadenhead, who said he set up the WTCattack list because most of the Web sites reporting news had ground to a halt. "Amateur news reporters on weblogs are functioning as their own decentralized media today, and it's one of the only heartening things about this stomach-turning day." The mailing list is still archived on Yahoo, but I've never gone back and reread the early messages. The attacks brought a bunch of new bloggers into the medium who covered terrorism and Islamic extremism and favored an aggressive pre-emptive U.S. military response to the attacks. They soon were dubbed warbloggers, and among the most prominent were Glenn Reynolds of Instapundit, Charles Johnson of Little Green Footballs and Andrew Sullivan. The internet grew because it provided access to a potentially infinite amount of information, and because it provided users with a 'voice' (talk.dot, alt.dot, flame.dot, etc.) to use that information in presenting their various opinions. The commercial aspects, once allowed, made it relatively free to engage in making 'opinion', and at whatever level that opinion actually was in reality. Now, public opinion is influenced by internet opinion, and some news blogs are sources which fact/detail that can't be depended on expecting from biased 'journalists' and the television broadcast media. A friend sent me this link. It's by NY Times best selling author Steve Alten. The book deals with the 9/11 incident, calling for the 8th anniversary to figure out THE TRUTH BEHIND THE 9/11 ATTACKS ONCE AND FOR ALL. "THE SHELL GAME."